Just €19.95 per month, or free with 5 trades or €250,000 in total assets. CFDs with underlying Indicies, Commodities, Stocks and Shares, more than 7,000 bonds and more than 50 currency exchange. Margin trading on more than 1,000 securities. Plus "Stop Loss" and conditional orders to protect your positions. 26 global markets, more than 6.000 real-time news items per day, plus macroeconomic calendar. Build your own dashboard: decide its content and arrange windows as you like – including across multiple screens. Go into the Preferences menu and choose the background colour, your alerts, configure up to 8 lists and save your settings. Nothing to install: launch PowerDesk from your browser and you will have all your pre-set lists, even on different computers. You can launch PowerDesk directly from your PC's desktop. Download the icon and save it to the desktop. Trading just became even quicker and easier. No compromises: thousands of products and all the tools of the trading room, all in a single, easy-to-use interface. PowerDesk is keeping up with the evolution of products, offering an expanding range of services and new developments to make your trading even more professional. Dynamic and automatic ranking of all updated financial instruments according to performance, volumes and exchange values. Allows you to duplicate the WatchList to simultaneously monitor your securities lists or your preferred markets. Now you can aggregate your orders in three columns differentiated according to trading strategy. You can see a graphic representation of prices in a more linear fashion so that market trends are even more clear. To identify the areas of support and resistance at a glance. Choose the account to work with directly from the platform. Discover how easy it is to build your trading strategies with PowerChart. View more than 90 technical indicators and make, amend and cancel orders – including 'Stop Loss' and 'Take Profit' instructions – directly from the chart. See up to six charts in a single window, with customisable timeframes and individual analysis. Track the performance of the main government bonds in real time using charts. You can monitor long-term investments, with daily charts going back up to 30 years. Shows all the trades completed on the market – an essential tool for intraday traders. you can perform analysis and build strategies straight from your PC. Background colours, grids, zooming, labels: personalise every detail of PowerChart according to your needs. We have the answer you need. Your Vocal password can only be used on a registered mobile phone. Leave us your details and one of our specialists will get back to you. Vai a Got bonds and funds? Transferring them to Fineco is simple and automatic. Over 50 CFDs with underlying shares of major US companies, also overnight. Contracts For Difference (CFD) trading is available to clients following the assessment of their knowledge of derivative instruments and the subscription of the Derivative Trading Contract. CFDs (Contracts for Differences): a CFD is a financial derivative, which you can buy or sell with FinecoBank as your direct counterparty. Its value is directly related to that of an underlying asset (securities, indices, currencies, futures on bonds, futures on volatility indicators and futures on commodities) and consequently follows the price movement in the underlying asset. In particular, in CFD trading your profit/loss is given by the difference in value between the opening price and the subsequent closing price of the contract. The opening price and the closing price are determined by the Bank applying, if appropriate, a mark-up or a spread on the underlying price to the extent indicated by the economic conditions at the time. CFDs are characterized by a strong leverage effect. This means that a relatively small price movement in the underlying market will have a proportionally higher impact on the value of your margined position and an unfavourable price movement may result in losses exceeding your initial margin deposit (increasing underlying price for short positions, decreasing for long positions). CFD Positions open for more than a working day (overnight) are subject to a multi-day position fee. 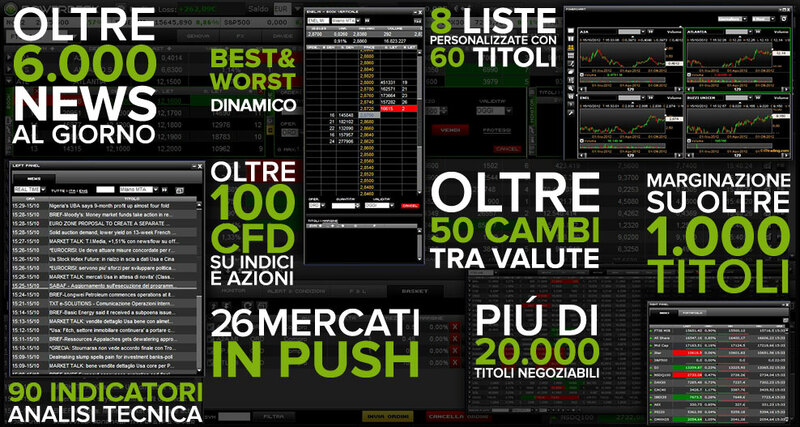 PowerDesk: is the Fineco professional trading platform which envisages a monthly fee of €19.95. To use it you must proceed with activation at the page of the section reserved for clients of the Bank's website. For detailed information on PowerDesk you can consult the user manual or the help tabs on the specific page in the Trading/Platforms section. Europe's most popular direct banking platform: Fineco is the leading European broker by number of orders executed in 2016. Source: 2016 financial statements of the main European brokers (Comdirect, ConsorsBank).